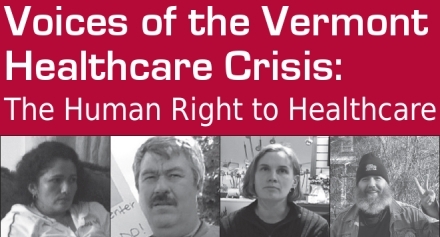 On December 10, 2008, the 60th Anniversary of the Universal Declaration of Human Rights issued by the United Nations in 1948, the Vermont Workers' Center (VWC) officially issued a comprehensive report entitled Voices of the Vermont Healthcare Crisis: The Human Right to Healthcare. This report was compiled from personal interview surveys conducted with over 1,200 Vermonters and human rights hearings held this Fall across the state. "In this report, we present a collection of voices of Vermonters impacted by the healthcare crisis and present data examining our current healthcare system which is failing us," says Dawn Stanger, President of the Vermont Workers' Center. "We found that over 95% of Vermonters believe healthcare should be a human right. We are organizing a statewide grassroots network to establish healthcare as a human right and making it a public good for everyone."